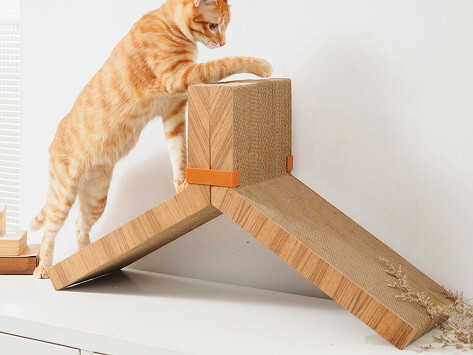 Two sleek, modular cat scratching posts with over 30 configurations. Made entirely from recyclable cardboard and 90% post-consumer content with a real wood veneer finish, this scratcher is like a combo cat toy and eco-friendly art installation. Cats can’t get their paws off of it and strong flutes leave significantly less cleaning up to do. Dimensions: 19.9" x 7.7" x 8"
I’ve put this scratcher in many positions. My cat loves every one of them. My cats are using this and not my chair anymore. KATRIS is part-time modular cat scratching post, part-time décor piece. These modern cat scratchers are 100% recycled and made from 90% post-consumer material. The result is a nontoxic, super sturdy surface with minimal shredding that cats can’t keep their paws off. It’s no coincidence that KATRIS bears a striking resemblance to the old-school, classic game “Tetris.” Much like the colorful brick game, KATRIS modules can be organized and secured together with clips in myriad ways to suit your space. A module can double as a bookshelf, coffee table, shoe rack . . . even sitting area. 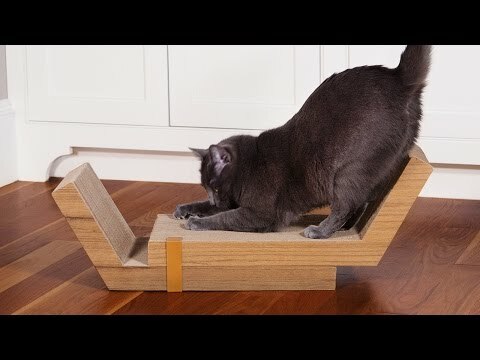 Maker Jeff Lin combined his background in design and experience in the paper industry to create a scratcher for his cat, Ceo (pronounced See-oh). Ceo loved scratching the strong flutes and liners and Jeff appreciated having significantly less cleaning up to do. Eco-friendly, handcrafted, and attractive, this scratching post will be a favorite for both you and your feline family member.